The Bentley Mulsanne is on another level of comfort and elegance with a look and design that manages to be bold, yet understated at the same time. It’s remained much the same over the years with only a few updates where needed to being it up to spec with new technologies. 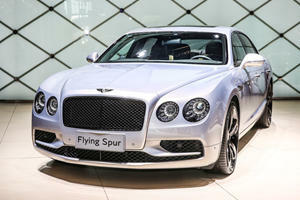 Besides the luxury factor, the Bentley Mulsanne is fast and powerful too with a twin-turbocharged 6.8-liter V8 driving 505 hp and 752 lb-ft of torque to the rear wheels giving the saloon some mighty impressive performance figures and a top speed of 185 mph. Pricing starts at around $305,000 and depending on the options that can rise dramatically. If the Mulsanne is too small, there’s also the extended wheelbase version, and if it’s too slow there’s the Speed version. When you have cars that combine performance and luxury there are many that come to mind, but some need to have the word ‘opulence’ added to the description. 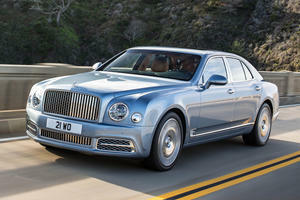 The Bentley Mulsanne is one such car. With a little over 500 horsepower on tap the car has more than enough to fill the performance quota, but saloons like this are more about comfort and luxury. Most who will buy a car like this will hardly drive it themselves; they’ll be driven in it while running an empire on the move – and if you have to ask how much one costs, you probably can’t afford one. The Bentley Mulsanne is all about space, evident when you look at the overall size of the car and see that it’s rates as having space for just four people (a fifth spot can be had if absolutely necessary). Trim and finishes are quite literally the best that money can buy, and the available combinations are almost endless with a choice of 24 colors for the leather alone, and the veneer can be had in Burr Walnut, Dark Fiddleback Eucalyptus, Dark Stained Burr Walnut or Piano Black. Options include things like veneered iPad picnic tables, lamb’s wool rugs and ventilated front and rear seats with a massage function. The detail is so fine that you can specify the colors for the embroidery, stitching, cross-stitching and piping. If you feel the need, you can have a refrigerated bottle cooler with a choice of bespoke tumblers or champagne flutes for when you need to toast that corporate takeover. Driving the Bentley Mulsanne is the motoring equivalent to floating on air completely oblivious to what’s happening in the outside world. When the chauffeur is taking personal time, the Mulsanne becomes a driver’s car. The stiffness of the chassis and the responsiveness and feedback from the hydraulically assisted power steering are akin to a smaller, lighter performance sedan, you’ll find that you can actually point and squirt and the massive car does what you want it to do. Throttle response is linear, apply slowly and the power rolls on or stamp it fast and the rear lets you know it wants to come past you, but it’s all too refined to actually try go sideways, gentlemen don’t do that. The torque from the V8 comes in quite low and the transmission so there’s never any reason to rev hard to get anywhere, and the payoff is that the passengers hardly know the engine is actually working so the ride is silky-smooth. When a car is as luxurious as the Bentley Mulsanne you’d be forgiven for thinking that performance would be muted and toned down, firstly because the car is made to shuttle captains of industry around at a smooth and comfortable pace so that the Dalmore 62 Single Highland Malt Scotch Whiskey doesn’t spill on the lamb’s wool rugs. The Bentley Mulsanne is equipped with a rather large 6.8-liter V8 that’s assisted along by a pair of turbochargers resulting in 505 hp and a massive 752 lb-ft of torque. The 8-speed automatic transmission is perfectly up to the task and affords silent, smooth operation. 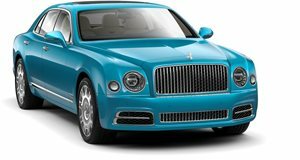 If a dash of speed is required, the Mulsanne becomes insane, with a 0-60 mph time at just 5.1-seconds and has a top speed of 184 mph. The Bentley Mulsanne is the car to have when you want to announce to the world that you’ve just made your first ten million dollars. It’s the epitome of luxury and power that can be customized to be completely unique, not that there will be many see on the roads to compare to. It’s a combination of old-school, hand-crafted build quality with the best materials possible while at the same time being filled with enough tech to successfully run a Fortune 500 company on the move.